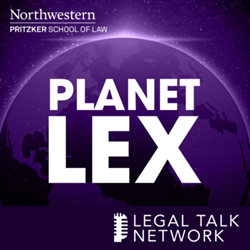 Legal Talk Network debuts Planet Lex: The Northwestern Pritzker School of Law Podcast with episode tackling "Making a Murderer"
Legal Talk Network and Northwestern Pritzker School of Law are pleased to announce the debut of Planet Lex: The Northwestern Pritzker School of Law Podcast. Planet Lex is a series of conversations about the law, law and society, law and technology, and the future of legal education and practice. In other words, a bunch of interesting stuff about the law. In the debut episode of Planet Lex, Defending Brendan Dassey of “Making a Murderer”, host Dan Rodriguez, Dean of Northwestern Pritzker School of Law speaks with Northwestern Pritzker School of Law Clinical Professor of Law Steven Drizin and Clinical Assistant Professor of Law Laura Nirider about youth interrogation, false confessions, and their representation of Brendan Dassey. Steve shares that he was contacted by a friend in the Wisconsin state appellate defenders office to represent Brendan and that because of the Wisconsin appellate process they had to do two years of intensive investigation before filing their appeal with the Wisconsin Court of Appeals. Upcoming episodes will discuss the evolution of copyright in music, STEM focused education and law, and handling sexual misconduct on campus with guests Peter DiCola, Emerson H. Tiller, Leslie Oster, and Deborah Tuerkheimer, all of whom are professors at Northwestern Pritzker School of Law. “This is a unique opportunity to dialogue around some of the most relevant legal topics today. Given the speed of change, it’s critical that we create access to the most advanced thinking in the field, and that is the primary goal here,” said Dean Rodriguez. “We are delighted to partner with Northwestern Pritzker School of Law for the Planet Lex podcast. In addition to being an amazing institution, our new friends at Northwestern have made this such a rewarding endeavor,” Legal Talk Network Executive Producer Laurence Colletti said. “Their abilities to communicate and attract top minds will enable us to deliver content that both entertains us and arouses our intellect. " The podcast can be subscribed to on iTunes, Google Play Music, RSS, Stitcher, on the Legal Talk Network iTunes app and the Android app, or by email. Legal Talk Network is changing the way legal professionals consume content. The network features podcasts by award-winning hosts and some of the most well-known industry thought leaders and organizations, including the ABA Journal, American Bar Association, The Florida Bar, Robert Half Legal, and Above the Law. Legal Talk Network’s shows cover the important tools, technology, and events that shape the industry featuring high-profile guests and legal experts. Legal Talk Network is owned and operated by LAWgical, specializing in marketing, software and media for the legal industry. Follow on Twitter @LegalTalkNet. Northwestern Pritzker School of Law is one of the country's leading law schools. Founded in 1859, Northwestern Law advances the understanding of law and prepares its graduates to excel in a rapidly changing world. Northwestern Law prides itself on its interdisciplinary research faculty, low student-faculty ratios, and collegial culture. Its downtown Chicago location in close proximity to courts, commerce, and public interest activities enables students to experience the practice of law, as well as its theory, in one of the most vibrant legal and business communities in the world.